I hate cake balls, anyone else? Now you are probably like why the heck is this girl giving me a recipe for cake balls if she hates them? These Healthy Funfetti Cake Balls actually taste more like cookie dough to me, but when I think of funfetti I think of the box of Pillsbury Funfetti cake mix not cookies. So here we are with a cake ball instead of a cookie dough recipe. But really, the moist, mushy inside of cake balls made from mixing cake and icing together just does not jive with me. Let's also all take a moment to cringe while we say the word, moist. OK, moving on. Protein balls, you've seen them all over Pinterest and instagram, protein bites, energy balls, energy bites whatever you want to call them. I even have a few recipes found here and here. They are basically just a cop out on a real dessert, but also pretty genius to have stored in your fridge when you need something sweet or need a tiny bit of substance before a workout class or something of that nature. I love how this funfetti version came out because 1. i mean how cute? and 2. the ingredient list is short and if you are a borderline health food junky like myself, you most likely have these ingredients in your pantry. If you don't...come over to my house, I'll make you some! Add coconut into a food processor and blend until it becomes tiny grounds of coconut. Add everything else but the sprinkles, pulse until it becomes thick crumbs (dough is pretty dry, you can add more almond milk if needed). 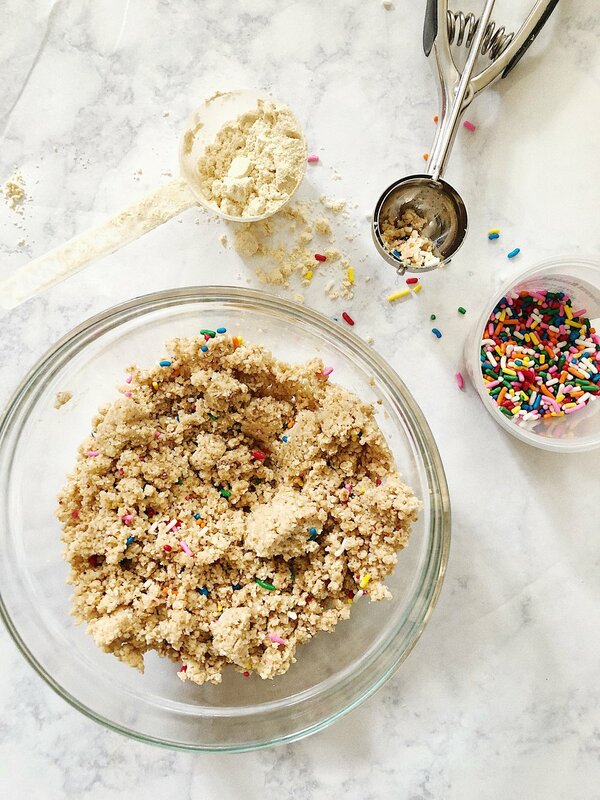 Pour into a bowl and stir in sprinkles. Using a cookie scoop, press and roll into golf ball size bites! Refrigerate for at least 1 hour before serving! Keep in an airtight container in the fridge! Good for 1-2 weeks. Now for the announcement. If you have been keeping up with Take A Bite, you probably are not blind to see that I have been incorporating some of Arbonne's nutrition products into my daily routine over the past couple months...hello protein shakes. Well, after thinking it over and going back and forth, I pulled the trigger and decided to start selling Arbonne myself. I truly love the products and use them everyday. Their nutrition line is something I completely agree with and have personally reaped the benefits of since starting to use them. I swore I would never sell something like this, but I just really love the products and want to be a source for others who are interested in trying them or who may already love them too.